Save 10% on Garbage Disposal Repair in Atlanta by Printing this Coupon and Presenting at the end of the job. Call 770-679-7705 for an appointment today. Your garbage disposal is one of your kitchen’s best friends. It is one of the most important appliances you have and if not sealed and working properly, can lead to unsanitary conditions, and even drain blockages. While a good disposal can last many years, it is not uncommon for it to periodically require repair or replacement. Many consider our disposers to be the best in the business. We certainly do as well, and are confident enough in your satisfaction that we will honor your investment with a rock solid warranty. 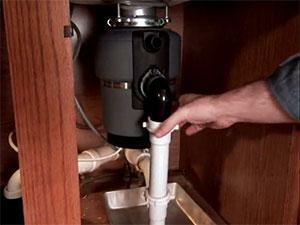 The garbage disposal is one of the most commonly used machines in Metro Atlanta homes. Due to heavy use, it’s likely issues will arise due to forks, rocks and large quantities of food placing strain on the garbage disposal. Since most of us don’t have the time or the necessary skills needed to fix a garbage disposal on our own, it’s good to know there are The Educated Plumbers in your area waiting to fix your disposal. This can range from a piece of silverware to a fibrous piece of food. First, do not try to remove the object if it is sufficiently jammed! Second, unplug the disposal. Contact Delta Plumbing to remove the foreign item. These can originate from a variety of things, including congealed grease, fibrous tissue, dirt, etc. Regardless of the reason, it’s a problem that needs to be fixed. Please contact The Educated Plumbers to clean out the clog. Our plumbers will use products that are safe for your drains. Additionally, it may be necessary to clean out the P trap, and if the clog is severe, the line may need to be snaked. When your disposal is overloaded it has a feature that automatically shuts it off. This happens to prevent the machine from getting too hot. You can try hitting the reset button; however, if this doesn’t work, then you will need to reach out to Delta Plumbing’s Garbage Disposal Repair Atlanta Division. The garbage disposal may require some electrical work. Call us today at 770-679-7705 or schedule an appointment online for Garbage Disposal Repair. One of the most important machines in your kitchen is located just within the sink. Garbage disposals in homes are so ubiquitous, that one can’t think of doing without the device. If you are in need of a garbage disposal installation / replacement, call the plumbing experts at Delta plumbing. We provide state of the art garbage disposals that will “chew” up even the most fibrous foods.